Nowhere is the tension more apparent than in Union Hill, which has made a comeback in the past decade after being largely ignored and abandoned. Scott Addition is more active and does both development (commercial and residential) at the same time. Precisely what we’ve dealt with since becoming residents of Union Hill. I don’t understand what CAR is doing, it feels like they’re trying to turn our neighborhood into Short Pump with new development. They are simultaneously holding actual residents to the strictest possible standards on every tiny detail of their homes. I hope this article may shed some light on the problem and eventually change some things. So glad that “Serving the community” is apparently the goal here…. I moved to this city because at the time I thought there was a good balance between commercial development and historic preservation. I chose my neighborhood because I wanted to be as far away from a Short Pump lifestyle as possible. Everyday it gets worse around here and I feel duped. Quick, cheap, will not stand the test of time developments are on the rise, all wrapped up in a "pretty" claims of luxury living bow. This exact property was the center of the neighborhood’s drug trade for years. What we should all do is thank the developer for investing here. Remember when within the last few years this was an open air drug market even a twitter storm couldn’t stop? Remember when the previous owner of this lot cut down all the trees and then tried to bury them in the ruined basements in the middle of the lot, in contravention of all sound environmental principals? Remember when the Shrimp Market, whatever you thought of Cheech or the prepared food, had three feet of actual raw sewage in its basement? Remember when you the only thing other than mac’n’cheese (and drugs) you could buy here were expired canned goods, stolen phones, single cigarettes, and predatory fortified booze products? All together now: density supports ground floor retail, that in turn creates the healthy, diverse urban place we all moved here to grow. I work and live here in the East End and I too greatly appreciate the historical charm of our neighborhood. I would also hate to see our area turned into another Short Pump as others have expressed. However, I strongly believe that in order for a community (or a whole city) to thrive, we must embrace change. I do not think that these new developments will take us down a path to be another Short Pump but instead will bring important economic development to the area. I also greatly support the development of mixed income housing. I know a lot of people worry that this type of housing would decrease property values but nationwide research actually shows that it does not decrease property values – and can in fact improve the economic health of a neighborhood. I encourage people to do some research and have open (hearted:) conversations about the changes we are seeing in Church Hill. I hope that we can find a way to engage with one one another across races, cultures, neighborhoods, and economic class to identify a boundary-free and blended community, where all feel welcome and supported! The proposed 4-story monstrosity at the Jefferrson Ave/25th St roundabout far exceeds the lot’s UB (Urban Business) zoning for maximum height (28 feet) and the commercial/public use of the 4th floor/rooftop space. The proposed project requires a Special Use Permit from the City Planning Commission (prior to City Council). Mr Jarreau and Mr Kleyman, when will your project be heard at the Planning Commission’s public hearing? Monthly hearings are open to the public, and the public can speak for/against as well as send letters to commissioners in advance. The CAR needs to be abolished and replaced with local civic associations that oversee the appropriateness when it comes to new structures or changes to existing structures within that locality. It makes absolutely no sense to have a single set of standards that apply to 16 different historic areas that developed at different times and for different reasons that dictate their architectural design. If anything, the CAR should serve only as an advisory or appeal board when disagreement between a resident and the local civic association occurs. Having dealt extensively and painstakingly with CAR over a simple thing as paint color, I quickly learned that developers and local residents operate on two different standards. Basically the CAR is a club, and a single homeowner isn’t in the club. To both booster and devan: the issue here is not building nor development. The issue is developers being held to a different standard than residents. We can have new development that creates housing and business in a way that fits much better with the existing character of the neighborhood. For example, if a private resident wanted to add a fourth story to their house I’m positive they would be flatly denied, not so with developers. New construction should fit in with the look and feel of the historically protected neighborhood, not stand out like a sore thumb. I do agree with the article that the design of the Urban Core development at 32nd and Marshall seems to do a much better job at being compatible with the neighborhood. Why have we let our neighbors get away with this shrill level of hyperbole that approaches outright lying when it comes to development? The Jefferson Avenue thing isn’t a monstrosity and CAR protects single family homeowners more than anyone else in this town. When it comes down to it, it’s your neighbors’ tone – and trying to use CAR to keep out what they perceive as undesirable projects – that creates immovable developers. How can you negotiate with a developer on their design choices when your neighbor is calling them a monstrosity? You can’t! Room cleared, conversation over, single-family white paradigm protected. As your neighbor truly intended all along. Hold your neighbors accountable to the same transparency they demand. Don’t let them bully you into believing your house will be ruined because of a nice thing a few blocks away or across the street. If they are using CAR and code words to keep diverse housing options out of our neighborhood, then they aren’t the progressives they say they are. Population density is a good thing, provided that it comes coupled with access to services/basic things like sidewalks and grocery stores. CAR requires that new buildings and additions be “compatible but differentiated” from existing structures and that they not create a sense of “faux historicism.” The end result is that new structures undermine rather than support the character of the neighborhood. What CAR should do instead is require that buildings either be built in historicist styles which match the styles of neighboring buildings or are appropriate to the time period that a district developed, perhaps with reasonable exceptions for new building designs that are so remarkable that they are works of art/are architecturally significant in their own right. The current CAR rules are a recipe for architectural mediocrity. Development is good, period. I applaud this! @10 – It’s untruthful and unfair to your neighbors to mislead them into thinking there is some sort of different treatment to homeowners solely because they are homeowners. The facts are clear. Homeowners and big building owners who want to paint their respective historic buildings’ doors any trendy color are treated the same as each other. Homeowners and big building owners who want to paint their respective brand new building doors any trendy color are also treated the same as each other – – – but differently from the old building owners. Old vs. new. Even a cursory view of the CAR guidelines and the long history of CAR decisions shows that the difference in treatment is a policy difference between old and new construction, fully grounded in the written guidelines available to one and all, not a developer vs. single family homeowner difference. Members of CAR have a tough job – a job that’s both unpaid and time consuming. Were it not for CAR and the city staffers that support the commission, those of us in Union Hill would have more of a mess in our neighborhood than we do now. Bring on the development and the gentrification. These neighborhoods have been neglected and/abandoned for decades. Now people want to invest in these broken down houses and empty lots and people are complaining? Are you people insane? I think the best addition to the neighborhood I see coming is the j sarge building planned up 25th. Is that CAR approved, or what CAR is protecting us from? And the design of the building shown is precisely Vcu dorm/short pump and lame. With respect and apologies. And also with a note that I still support it… just…. serious question: why can’t we do better? CAR says you can’t paint your door bright pink. CAR allows developer to build a community hub on an old, vacant drug corner. Matt Jarreau is a stand up guy and has been investing in and improving Church Hill for many years. Unless you’ve been to the meetings to hear his opinions on this project, unless you’ve seen the amount of work and revisions and consideration that have gone into it based on public input, unless you’ve analyzed his previous work, you shouldn’t be too quick to cast stones. Disliking the style is kosher, that’s subjective. But to make it seem like this developer just rolled into Church Hill and did whatever they wanted to is misleading and dismissive of the huge amount of work Matt has gone through to make the space a good fit for the community. Anyway, I put my crappy leaky wood windows back in and caulked them shut to keep out the rain/drafts that caused me to replace. I researched the fastest growing privacy trees. I bought a few, planted, and now 3 years later, they’ve grown high enough to cover both lower and upper windows on my 2 story house. When I have some downtime, I’ll be re-installing my vinyl windows again. It’s sad, but this is how I handled it, and I’d recommend the same to any of you. Just hide your house, you get some shade + no more non-sense from CAR. I don’t know why we people that don’t even live in the historic districts (looked up their names on Richmond property searches) making architecture decisions (and no, I don’t buy that any architecture training or qualifications that justify them over a regular old non-investor homeowner who just wants a visually matching neighborhood). Well. If what we would get without CAR is buildings like the J Sarge building, and what we get with them is DormPump, then I’d rather CAR just not. When the wolf at the door looks better than the people at the table…time to invite in the new and invite out the old. Nearly 10 years ago the City came to Union Hill with a great idea for rezoning our neighborhood as part of the master plan. They wanted to make all of Union Hill R-7, a zoning tool that is basically the equivalent of a suburban single family development. Of our own volition, we asked that the City instead rezone us to R-63, a tool that allows for multifamily infill on appropriately sized parcels, as well as by-right commercial uses on the corner. We made the neighborhood a place that developers would want to invest, specifically for the purpose of getting greater density and all of the retail access density can bring. Matt’s project isn’t perfect, but it’s largely in keeping with the spirit of what we pursued as a neighborhood nearly a decade ago. @17 and @19 and @24 and @27 – I have no issue with CAR’s existence. We need CAR, or something like it. I think they do a great job of protecting existing buildings. 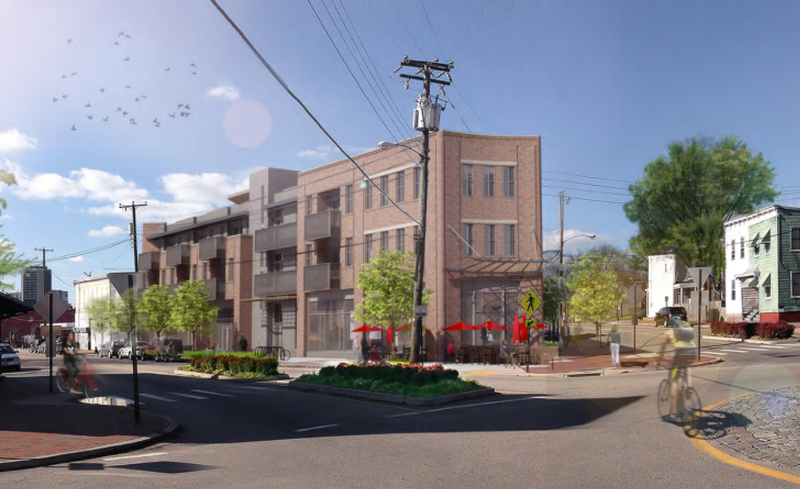 But I think the complaints about this building in particular (Shortpump/VCU/”Dormpump” comment, for example) result from the fact that CAR does not actually want new buildings to be built in Historic or Historicist styles. Again, CAR guidelines (and the National Parks Service Guidelines they reference) call for “compatible but differentiated” architecture and “abstract reference” to neighboring buildings, rather than requiring new buildings to be built to actually look like neighboring historic buildings. This is supposed to protect the historic integrity of the neighborhood, but actually undermines the neighborhood’s historic character by requiring new infill to be contemporaneous and rather bland. Also, Matt Jarreau and Co. have been very neighborly and have done a lot to address neighbors concerns. As developers, he/they may be perfectly happy with this situation, or may be stuck building something they aren’t really thrilled about. I have no idea what the developers are thinking (Perhaps “Oh my god, what the hell have we gotten ourselves into?”) and it’s almost besides the point. The building isn’t bad, but it isn’t amazing either, and it is out of place in a historic district. What actually matters is that CAR’s rules and guidelines for new development undermine rather than protect the character of the district. On an final note – it’s been rather frustrating watching discussions about density and off street parking and zoning play out in the context of CAR. It’s not entirely related, but it seems like people are complaining about the wrong things to the wrong people. I’m thrilled to have more density in the neighborhood, and think a lot of other folks are as well. But aesthetically and architecturally, we can do better.